Conventionally, evolution has always been described in terms of species. 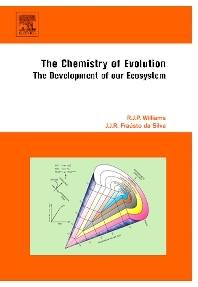 The Chemistry of Evolution takes a novel, not to say revolutionary, approach and examines the evolution of chemicals and the use and degradation of energy, coupled to the environment, as the drive behind it. The authors address the major changes of life from bacteria to man in a systematic and unavoidable sequence, reclassifying organisms as chemotypes. Written by the authors of the bestseller The Biological Chemistry of the Elements - The Inorganic Chemistry of Life, the clarity and precision of The Chemistry of Evolution plainly demonstrate that life is totally interactive with the environment. This exciting theory makes this work an essential addition to the academic and public library. Chapter 1. The Evolution of Earth-The Geochemical Partner of the Global Ecosystem (5 Billion Years of History). Chapter 2. Basic Chemistry of the Ecosystem. Chapter 3. Energy, Order and Disorder, and Organised Systems. Chapter 4. Outline of Biological Chemical Principles: Components, Pathways and Controls. Chapter 5. First Steps in Evolution of Prokaryotes: Anaerobic Chemotypes Four to Three Billion Years Ago. Chapter 6. The Evolution of Protoaerobic and Aerobic Prokaryote Chemotypes (Three to Two Billion Years Ago). Chapter 7. Unicellular Eukaryotes Chemotypes (About One and a Half Billion Years Ago?). Chapter 8. Multi-Cellular Eukaryote Chemotypes (From One Billion Years Ago). Chapter 9. The Evolution of Chemotypes with Nerves and a Brain (0.5 Billion Years Ago to Today). Chapter 10. Evolution due to Mankind: A Completely Novel Chemotype (Less than One Hundred Thousand Years Ago). Chapter 11. Conclusion: The Inevitable Factors in Evolution.